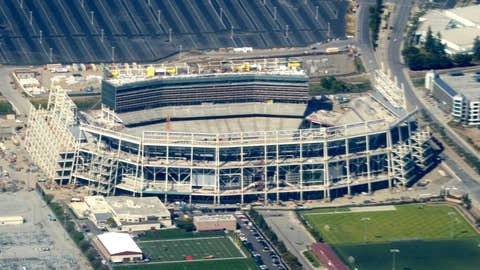 An aerial view of the construction of the 49ers' new stadium in Santa Clara, Calif. The San Francisco 49ers will move into their billion-dollar Mecca in Santa Clara, Calif., next season, but a lack of parking in the area around Levi’s Stadium reportedly will keep the team from hosting weeknight games in the immediate — and potentially foreseeable — future. According to SFGate.com, the Niners are prepared to handle 21,000 cars for Sunday home games, relying mostly on local businesses and garages to supply the parking. But it’s still unknown what the team would do to accommodate a game day crowd on a Monday or Thursday night, when games kick off at 5:30 p.m. PT, while many employees in nearby businesses are still at work. As a result, there will be no weeknight games in San Francisco in 2014, and potentially longer. Such a proposition might not be so easy to execute, however. For example, Nearby Mission Community College is said to be renting the team 2,200 parking spaces on Sundays but said it can’t make that commitment during the week. And there’s a thought that the Niners might face similar pushback from other businesses in the area, as well. Perhaps everyone will have a better idea how a weekday game will pan out (and how to best plan for one) after Cal hosts Oregon at Levi’s Stadium next season in a Friday night game that was scheduled in Santa Clara because of – what else? – parking issues at Cal’s home stadium in Berkeley. • Jadeveon Clowney was reportedly ticketed for driving 110 mph in a 70 mph zone. • Jesse Owens’ 1936 Olympic gold medal sold for nearly $1.5 million at auction. • The Detroit Lions get heckled by everyone – including the homeless. • Sarah Palin is getting her own show on Sportsman Channel. • This story on Reddit makes LeBron James sound like a pretty OK guy. • Michigan State students are raising money for repairs to a car flipped during the post-Big Ten Championship riot at the school. • A Quebec minor league hockey player suffered a nasty gash to his cheek (BEWARE: GRAPHIC PHOTO) after being cut with a skate.